On this day, exactly mumblecough* years ago, the heavens opened wide, and in a breathtaking expanse of starlight and trumpets, my wife was born unto this Earth. Okay, so maybe that’s not exactly how it happened. My research departments suggests there was actually a hospital involved. And doctors. And some nurses or whatever. Nervous-excited expectant parents who are awesome people and eventually became my in-laws. That kind of thing, i.e., more hot water and towels than actual trumpets. Exaggeration, aside, though, today is, in fact the Puddinette’s birthday. And yes, it’s kind of a Big Deal. The thing is, the Puddinette isn’t just my wife or the mother of my remarkably cute and smart-alec-y kids. She’s the glue that holds us together as a family, and the thin, protective barrier that prevents the forces of dirt, chaos, and decay from overwhelming our already complicated life. Seriously, if she up and decided to go on strike or something, they kids would be wandering around the neighborhood gutters with shoeless, dirty feet, even dirtier faces, and clothes that looked like they might have been new around the spark of the industrial revolution and then worn constantly for a century of work in a coal plant. That is, of course, I didn’t just dress the kids in Hefty bags. I mean, if I got the “Odor Lock” kind they probably wouldn’t have to shower or whatever but once a week! Anyway, today, then, is for the Puddinette. She’s the jelly to my peanut butter**, the cream for my coffee, the ala mode that makes my apple pie-ness better than those frozen Mrs. Smiths frisbee puck things. Or something. Point is, we’ll do our best to pamper her, and the kids will try (it’s the thought that counts) not to bicker amongst themselves too egregiously so she can enjoy her day in relative peace. Admittedly, the moments of calm will come and go like the eye of a proverbial storm, but such is the way of summer birthdays when you have a bunch of kids. It’s probably for the best anyway, because too much quiet makes a mother twitchy about what’s going to get smashed, and too much time to think will inevitably give her a chance to remember all the projects I’ve promised to do around the house that haven’t miraculously completed themselves yet. Well, okay, so that’s not actually a Coach purse. 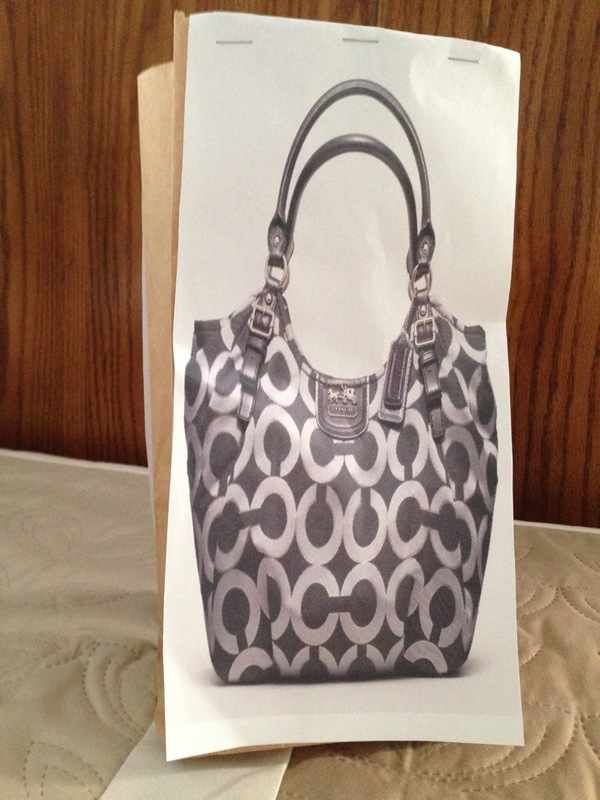 It’s a picture of a Coach purse stapled to a lunch sack. But bear with me! There’s a good explanation! Thing is, the Puddinette digs her purses. Like, as much as I dig sandwiches and beer. And just the same way I hesitate to have her pick out a six pack for me (because she’s much more concerned with what’s on sale than what has Centennial hops), I understand that I am woefully inadequate to the task of buying her a purse. At least without specific instructions, photographs for reference, a train schedule for when the the purse in question might arrive, and a card with words “Puddinette’s Purse” scrawled in marker on it like a limo driver at the airport. Were I to attempt to choose a new purse for the Puddinette without any of that, after several hours of flailing about like a rag doll, a fifth of bourbon, and some (misplaced yet understandable) concern for their own personal safety from store employees, I’d end up with a hangover and some green-orange monstrosity that I liked because it reminded me of the Hobgoblin, but wasn’t so much something she’d love to show off at Parent Teacher conferences. Instead, I’ll let her pick out her Birthday Purse of Joy while I go to the beer store for a new IPA. At any rate, a very Happy Birthday! to my wonderful, beautiful, tolerant, and much-suffering wife, the incomparable Puddinette. I don’t know what I’d do without you, besides live a ditch. And nobody probably wants that. Well, except you, possibly, when I’m snoring at 3 AM and keeping you awake. But no sane person would argue that’s not justified. *The Puddinette is not the kind to be over concerned with who knows how old she is. She doesn’t go for any of that silly “Look, it’s my 29th birthday again nonsense!” But the internet never forgets things, and I don’t want there to be any evidence of her actual age available when I’m trying to get the senior discount at the movies when we’re only 53.